What’s the Difference Between a Freight Broker and a Broker Agent? 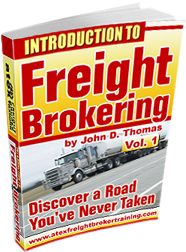 A freight broker is fully self-employed and is required to obtain his or her broker authority. A fully self-employed freight broker will do his or her own invoicing to customers and will pay the motor carriers. Essentially, the freight broker is running the entire business. A broker agent works for another freight broker and does not need to obtain a broker authority. The agent works under the authority of his or her freight broker and is not responsible for invoicing or paying the trucks. The agent then splits his or her commission with the freight broker. There are pros and cons to each option. First, a fully self-employed freight broker is required to get their broker authority but they retain 100% of the profit on each load. Further, the freight broker is totally responsible for invoicing the customer and making collections as well as paying the motor carriers. Cash management skills are an absolute necessity. Since time and effort are required to run an entire business, the freight broker has somewhat less time to search for new customers and find trucks as compared to a broker agent. Second, a broker agent is not required to get his or her broker authority and, therefore, this option is less costly. But the broker agent splits his or her commission on each load with their freight broker. Most of the agent’s time is spent searching for new customers and finding trucks. They generally have more time compared to the freight broker because the agent is usually not responsible for the “backroom” office work. Lastly, if you are starting your own brokerage and are serious about hiring agents, you need this helpful resource: >>> The Definitive Guide to Growing Your Freight Broker Business Using Broker Agents <<<. It's helpful for agents as well. There is no resource like this anywhere for brokers or agents.